Global Studies students are given the tools to understand the processes of globalization and their consequences, and they are empowered to shape their world as the next generation of global leaders in business, education, government, and the non-profit sector. Culture & Society courses concentrate on the tensions between local ways of life with deep historical, linguistic, ethnic, and religious roots and today's pressures for transnational cultures and multiple identities, fueled by the communication of ideas and the movement of people all around the world. Governance & Conflict courses focus on challenges to the nation-state from forms of governance above (regional and global governance) and below (autonomy and secessionist movements) and from security threats beyond interstate warfare (ethnic conflict, terrorism, civil wars). Markets & Resources courses address the interactions among global, regional, national, and subnational economic processes over resources and market dynamics, their effects on different societies with respect to economic growth, poverty, inequality, the environment and interactions among market forces, political institutions, and public policy. These three pillars of globalization capture the principal dimensions of the multifaceted interconnections increasingly defining the world we live in—among nation-states, international institutions, nongovernmental organizations, and ethnic, cultural, and religious groups. Global Studies examines the ways in which people across the globe are affected every day by an unprecedented array of linkages that defy geographic and political boundaries. Global Studies draws on insights from disciplines across the humanities and social sciences to give students the theoretical and methodological skills and the knowledge base necessary to understand this complex and rapidly changing world. • Demonstrate appropriate mastery of a specialized area of global studies. • Demonstrate a critical understanding of current scholarly concerns, literature, and debates. • Identify and analyze primary sources. All UCLA students who plan to pursue the Global Studies major must apply for entrance to the major. Incoming freshmen may be admitted to UCLA as Pre-Global Studies majors; however, they will still need to apply for the major once at UCLA by Fall of their junior year. Incoming students should have a back-up major. Students admitted under another major may also apply to switch to Global Studies. If attending new student orientation, please request to attend the Global Studies departmental orientation session in the summer once admitted to UCLA. If you can't attend orientation, make sure to contact our office. 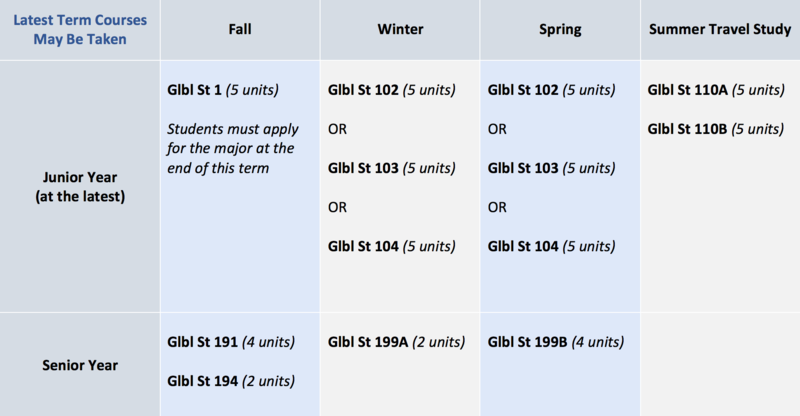 Effective Fall 2019: Major applicants must complete Glbl St 102 (previously 100A), 103 (New Course) and 104 (previously 100B) before graduating. Students who have taken 100A and 100B should not take 102 and 104 as they are the same courses. completed all preparation courses* (courses may be in progress in the Fall) with a minimum UC GPA in these courses of 3.25. *Completion of level 3 of the foreign language is acceptable when applying for the major. Level 6 of the foreign language is required to complete all preparation requirements, but can be done once accepted to the major. The main factor considered for admission is preparatory GPA and Glbl St 1 grade. Meeting the minimum preparation requirements does not guarantee admission to the Global Studies major. We have a limited number of spaces allocated for new admits, therefore the application process is very selective. The Global Studies major is designed for highly motivated students who are looking for a course of study leading up to a senior thesis (35-50 pages including bibliography) on an issue related to globalization of their choosing. Students are asked to have a backup major in mind when applying, in case they are not accepted. After the application period has closed and grades for Fall Quarter courses have posted, the Chair of Global Studies will review applications. IMPORTANT: Before you start the Application, make sure to model your DARS for Global Studies and check that all preps for Global Studies are showing up in the correct fields. If they are not, please contact the Glbl St Advising Office. The notification period for entrance to, or denial of, the Global Studies major is targeted for Week 2 of Winter Quarter, if not before. Students are asked to refrain from inquiring about their application status until after notifications are sent out. - Register for a Global Studies travel study program (Glbl St 110A/110B) for the following Summer any time after November 15th via the UCLA Travel Study website. Please note that certain destinations fill up quickly so if you have a preferred program, enroll early. Please keep in mind that a $300 non-refundable deposit is required to enroll in one of these programs. Sophomore applicants have the option of enrolling in the travel study program their second or third year. Students who are not admitted to the Global Studies major will have the option of dropping Glbl St 110A/110B, but no refund of the deposit will be given. Keep in mind that these courses can be used towards any two of the three electives for the Global Studies minor. Core courses are offered once a year. Travel is required but students should visit advising office if they can't meet this requirement to explore options. WELCOME to UCLA! UCLA admitted transfer students declared under ANY major are eligible to apply to Global Studies, however, pre-Glbl St students will have priority to be admitted over students planning to switch or add Glbl St as a double major. Incoming transfer students must apply Fall of their junior year (your first quarter at UCLA). Application information and dates are available under the Applying to the Glbl St Major tab. Please make sure you sign up for summer orientation and sign up to attend the Glbl St Departmental counseling session to learn about requirements and application process. Please e-mail us if you can't attend orientation at idps@international.ucla.edu. You will have to submit a supplemental application to be admitted to the Glbl St major after your are admitted to UCLA. You may complete the foreign language requirement (intermediate level) at UCLA via placement exam or appropriate coursework, or abroad. If you hold an F1 visa and attended high school where instruction was not in English, the Glbl St foreign language requirement may be waived. Please check with your Glbl Stcounselor. Please review the Transfer Student Handbook and let us know if you have questions! The Global Studies minor provides students with an introduction to the fundamental dynamics of globalization. Through an interdisciplinary curriculum, students can explore the complex and multifaceted interconnections that characterize the contemporary world. have completed all preparatory courses for the minor with a minimum prep GPA of 2.00 (grades for all preps should be posted on Degree Audit Report). You do not need to complete any upper division coursework including Glbl St 102, 103, and 104 (previously 100A & 100B) prior to declaring. Note for students who have exceeded 150 cumulative units: please visit your counseling unit (College Counseling & Honors in Murphy Hall, AAP in Campbell, or Athletics- this can be found on My.UCLA<Academics<Advising and Academic Services) to receive permission to declare the minor prior to submitting the petition to be declared. Only students who have satisfied all the above requirements may request to be declared Global Studies Minor by submitting a petition no later than the quarter prior to your last quarter at UCLA. Effective Fall 2019: Students declaring the minor in Fall 2019 or after must follow new requirements. Please see updated worksheet. 19F Minor Worksheet: updated course requirements and course overlap rules. Minor Worksheet: detailed course requirements and course overlap rules. Travel Study Programs: See Summer Travel Study tab. Note: At least 20 units of the minor (upper and lower division) must be unique to the minor. Senior Thesis Booklet: Guidelines, requirements, enrollment procedures, and more. Senior Thesis Guidelines and Regulations: A more detailed description of procedures. Attend an online or/and in-person library research workshops/tutorials on narrowing down your topic, finding sources, organizing information, etc. Attend the mandatory Spring Glbl St Research Workshop and complete the worksheet to start narrowing down your topic and turning your topic into research questions! Global Studies Library Resource Guide: Find journals and sources for your thesis. Created by your librarian! Need to discuss topic ideas and find sources? Global Studies Majors who have completed their senior thesis (Glbl St 199B) in 18F, 19W, 19S. Cash award of $250-$500 will be given to a Global Studies major who shows exceptional scholarship in the production of their senior thesis. Only complete drafts will be accepted and thesis must address a question related to globalization. 1. Save your thesis (complete drafts only) as a word document. Cover page should include title, name, advisor name. First Page should include title only. Please do not include your name on any other pages. 2. Submit thesis HERE. Select "Self-enrollment" and enter the key 'thesisaward' when prompted. 3. Once enrolled, upload your thesis under the assignment "Global Studies Best Thesis Award." Please follow the above directions carefully. Applicants will be notified of their award status no later than Saturday, June 15th. All programs are taught in English (there are no language prerequisites). Financial aid might cover part of the cost, check with Financial Aid office for details. Global Studies Scholarships available. Glbl St Majors: Travel Study is a requirement**. The optional Glbl St 199 course (Directed Research in Global Studies, resulting in a research paper) can be petitioned to be used towards an elective requirement, where relevant. Glbl St Minors: Travel Study is optional. The two courses may be applied towards any two electives for the minor. The optional Glbl St 199 course (Directed Research in Global Studies, resulting in a research paper) can be petitioned to be used towards the 3rd elective requirement for the minor with Chair approval. **Although this is mandatory, students who can't meet this requirement should visit the academic counselor for advice. Ten Global Studies Travel Study scholarships of $1,000 are available for outstanding UCLA Global Studies Majors or Minors who are participating in a Global Studies Travel Program. Additional scholarships can be found on the IEO website . Global Studies Majors: Travel Study is a requirement**. The optional Glbl St 199 course (Directed Research in Global Studies, resulting in a research paper) can be petitioned to be used towards an elective requirement, where relevant. Global Studies Minors: Travel Study is optional. Students may apply the two courses towards any two electives for the minor. The optional Glbl St 199 course (Directed Research in Global Studies, resulting in a research paper) can be petitioned to be used towards the 3rd elective requirement for the minor with Chair approval. Global Studies majors may participate in EAP study abroad programs in addition to the required Glbl St programs if they plan accordingly. Quick Fact Sheet for EAP requirements for Glbl St. If you have an internship available for students, please visit this page. Our students have interned in Ecuador, Ghana, Japan, Spain, and Washington DC on health, education, business, marketing, policy and more. For recent/upcoming opportunities see our Facebook page. I A STD 195CE (International and Area Studies) allows students to receive academic credit for an internship in the Spring and Summer. The internship should take place off-campus and may be paid or unpaid. It is expected that interns will contribute roughly 8-10 hours each week to their internship. Summer Note: class only offered during the 10-week Summer Session A . Internships must overlap with a minimum of 8 weeks out of the 10 week session to be eligible for credit. 195CE courses are NOT offered during Summer Session C. To enroll in the course, students must secure an internship and schedule an intake appointment at the Center for Community Learning. International Institute students may petition to count this course for their major or minor. Students must submit a petition form to their respective program. Please consult with your department counselor for information on the electives this course may fulfill. The “Petition for Committee Review” form can be found on your major/minor website page under the 'Courses' tab. Multiple scholarships of $2,000-3,000 will be awarded to students enrolled in an internship course spring or summer who have secured international internships that promote leadership and career development. Students demonstrating financial need and good academic standing are especially encouraged to apply. Eligibility, additional information, and application available HERE. Three scholarships of at least $2,000 will be awarded to students enrolled in International and Area Studies (I A STD) 195CE this summer. Students who have secured internships abroad and/or are advancing their financial literacy are especially encouraged to apply. *NOTE: Program is currently not offered. Job Web. Resources for U.S. Students Going Abroad. Must become member for access. Payson Center for International Development and Technology Transfer internship and volunteer opportunities. Special link to volunteer programs in Africa. faayda.com. Great source for Jobs in India. Jobs 4 Development International development jobs and consulting opportunities. Go Abroad Search engine for jobs, internships, and opportunities abroad. Note: This is a work-in-progress. Your feedback is very important, so let us know which sites are more or less useful to you as you search for the right work experience. Also, let us know if and when you do get an internship as we'd love to hear about it! Please e-mail us at idps@international.ucla.edu. Thanks, and good luck in your search! What classes do I need for the Global Studies major? You can find information about requirements for the Global Studies major on the Major Worksheet, available on the website. How do I get into the Global Studies major? Complete all non-language preparation courses, and one modern foreign language equivalent to UCLA level 3. Remaining language courses may be completed while you have major standing. All preparation courses for the major must be taken for a letter grade. The GPA for all preps must be a minimum of 3.25. The minimum grade for Global Studies 1 is a B. Apply to the Global Studies major during the fall of your junior year, at the latest. Prep courses toward the major must be completed by the end of the fall quarter you apply (that is, they can still be in progress when applying to the major). What are the GPA requirements to enter the major? What are the ways in which I can fulfill the language requirement? Can I minor in Global Studies? Yes. The Global Studies minor does not require an application. As soon as you have completed the preps for the major, with a minimum prep GPA of 2.0, contact our office and ask to be declared a Global Studies minor. Can I get a Minor in addition to my Global Studies major? Sure, we encourage students to consider minoring in minors of interest that fall under International and Area Studies, such as Southeast Asian Studies, South Asian Studies, or African and Middle Eastern Studies. Please browse the Interdepartmental Programs website for more information. Which themes does the Global Studies cover? Both the major and the minor require courses based upon these thematic pillars in order to complete the preps as well as the full major and minor. Can I use courses for Global Studies and another major or minor? The maximum upper division courses that can count for the Global Studies major and another major is five, per the College’s rule. The maximum for the Global Studies minor with and other major or minor is two. It should be noted that different departments may have different overlap restrictions, so between Global Studies and the other major or minor, the department with fewer allowed overlaps is the restriction that is enforced. Can I double major in Global Studies and another major? The College's rule is that no more than 5 upper division courses may be common to both majors. Courses used for preparation requirements are not counted in this overlap. In order to double major, you first need to have taken all the preparation courses for both majors plus two upper division courses in each major. For additional information please visit the College of Letters and Science Website. What are the GPA requirements once I’m a declared major? Note that the Global Studies major requires a minimum GPA of 2.00 for all upper division courses combined for the major, not a particular grade in any one course. How do I get into a "majors only" class? Can I repeat a course if I got a C? No, you can only repeat if you receive a 'C-' or below. The newer grade will replace that of the previous one in your GPA (as long as you haven't exceeded the 16 unit repeat limit). You are not required to do so, however. For additional information please visit the College of Letters and Science Website. How do I get a PTE? PTE stands for "Permission to Enroll." PTE's are not given out in this office. Please contact the professor to inquire about a PTE #. What is a 199 (Independent Study) course and is it possible to have it apply toward Global Studies? 199 are independent studies courses in which you work directly with a professor on a course of study agreed upon by both of you. If you take a 199, you can have it count toward an upper division thematic pillar for Global Studies, depending on the focus of the study. The department the 199 is listed under doesn't matter. However, the topic must be related to the courses that are already applicable to the major. Before enrolling to a 199, file a preliminary petition with our office to see if the topic of your paper is applicable to the major. Once approved, create a “Contract Course” through MyUCLA. Official approval of the 199 course, however, will be based on the final paper. Please note that a 199 is separate from Global Studies 199A and 199B, which are required courses for the Global Studies major taken senior year, during which students work under individual faculty advisors to research and write original theses. Is it possible to apply courses not already approved towards Global Studies? For courses not already approved for Global Studies, you must petition to see if they can be applied. Courses that are not on the worksheet for the major or minor but are listed in the quarterly Additional Courselist have been preapproved to count toward Global Studies, and can be applied to the DPR upon enrollment with an e-mail to our office. For more information about the additional courselist, as well as a link to the petition form for courses that are not listed on the additional courselist, check the website. Can I take any courses P/NP to count towards Global Studies? All courses for Global Studies, including preparation courses, must be taken for a letter grade, regardless if they are taken at UCLA or elsewhere. While grades for non-UC courses do not get figured into the UCLA GPA, the grade will appear on the institution's transcript. If you choose to take a course P/NP, you can still get unit credit towards your degree, but won't count for your major. For more information, see the "Transfer Credit & Study Abroad Credit" link from the Global Studies homepage. How do I remove an incomplete once I finish the work? Once the instructor receives your completed work by the end of your next enrolled term, he/she will complete the paperwork with the department. The Incomplete notation is still on my transcripts even after I finished the assigned work. An Incomplete grade will never be replaced or removed from your DPR. The new grade will appear on your DPR the quarter the coursework was completed. Is there an order to the classes? All pre-requisite courses must be taken before you can officially enter into the major. Many classes also have prerequisites, so please check with the department or consult the current schedule of classes for prerequisites. The major requires that Global Studies 1 be taken in the fall before taking any of the core classes (Global Studies 102, 103, and 104). Students majoring in Global Studies must complete this sequence by the end of their junior year. Students minoring in Global Studies must complete this sequence by the end of their final year. Majors must also complete the summer Travel Study program (Global Studies 110A and 110B) before continuing on to the senior year thesis courses. Elective courses do not need to be taken in a particular order. I took a class at a Community College, will it transfer to UCLA? The courses usually transfer and will show on your transcripts. However, if they have not been posted, you need to make sure your community college sent the transcripts to UCLA admissions. Can I start major classes before I am officially accepted into the major? Yes, you may take any approved courses towards the Global Studies major, as long as it is not restricted and you meet the required prerequisites. How do I read my DAR? You can access your DAR from URSA. If you need assistance understanding it, see a College counselor or your major’s counselor for assistance. Can I get credit for my AP courses? I want to study abroad, can I have courses apply towards the major? Yes, this will of course depend on where you study abroad and if the courses you take are applicable to Global Studies. All courses must be pre-approved, but final approval is determined by the Global Studies chair via a petition, available on the website: //www.international.ucla.edu/idps/globalstudies/ (once you come back from abroad and courses have posted to your DPR). The number of courses you take abroad will depend on how long you intent to study abroad for. Visit the International Education Office for study abroad programs. I’m thinking of applying to graduate or professional school. What should I do? The Global Studies program does not have a graduate program in Global Studies at UCLA. You might want to inquire about the programs offered through the UCLA School of Public Policy and Social Research or the UCLA Political Science Department. You can obtain more information about these right on the Global Studies website. For Scholarship information, please contact the Scholarship Resource Center. How can I find an internship that is right for me? 1. REFLECT: What kind of work do you enjoy? In what specific area of development would you like to pursue a career (public health, planning, finance, human rights, education, environment, etc.)? What skills do you have or need to acquire and how will the internship help you meet those goals (field work, practical experience, opportunities for networking or building professional relationships)? What kind of institution do you want to work with? Do you have an interest in a particular geographical area or issue area? When do you want to do this internship? Are you willing to gain experience by volunteering alone, or are you only seeking paid internships? 2. TALK: to other students who have had internships and with career advisors. 3. SEARCH: Look for internships on Handshake, attend Career Center fairs, and read our Weekly Bulletin to learn about internship and job opportunities available to International Institute Students. Please go to our 'Internship' tab on the IDS website, or the 'Internships' page under 'Resources' in the top menu. There, you can find specific internships in a wide variety of professional fields that are great opportunities for IDS majors. Yes. You can receive academic credit by enrolling in I A STD 195CE. You must visit the Center for Community Learning for approval for your internship. If you wish to use this course towards specific IDS major requirements, please consult with an IDS advisor. For more information, please visit the 'Internships' page under 'Resources' for further details. Where can I find funding for my internship? The International Institute offers scholarships for internships abroad. Please see our Internships tab. For more scholarship information, please contact the Scholarship Resource Center. How can I get information on jobs? For job opportunities, you may contact or meet with an advisor from the Career Center. We also advertise recent job opportunities on our Weekly Bulletin. Handshake is a great way to learn about job opportunities for Bruins who are recent grads. Questions that go beyond your major (e.g., max units, adding, dropping classes, incompletes, pass/no pass units, GEs, minimum progress, expected cumulative progress, academic probation, graduating in absentia, academic residence, repeating courses, etc.) should be addressed to your college counseling unit. Visit the College of Letters and Science FAQ's webpage for assistance here. Is there Departmental Honors for Global Studies? Outstanding Global Studies majors are eligible to receive department honors. To qualify for graduation with departmental honors, students must (1) complete all requirements for the major, (2) have a cumulative grade-point average of 3.50 or better in upper division courses in the major and an overall GPA of 3.25 or better, and (3) complete Glbl St 199B with a grade of A– or better on the resulting thesis. To qualify for graduation with departmental highest honors, students must (1) complete all requirements for the major, (2) have a cumulative GPA of 3.75 or better in upper division courses in the major and an overall GPA of 3.50 or better, and (3) complete Glbl St 199B with a grade of A or better on the resulting thesis. Any departmental honors designation will be automatically awarded upon graduation. No application is necessary. What are your office hours? Where are you located? Our office hours are 10am-12pm and 1-4pm, Monday-Friday. We are located in 10357 Bunche Hall. The best way to learn about professors is by talking to students who have already taken a particular professor's course. There is also www.bruinwalk.com for student feedback. You can also obtain more information on a professor's background on the Faculty link of the Global Studies homepage or by going to the department homepage of the faculty member or the International Institute Centers.